Fresh produce makes the best ingredients. What’s better than summer corn and a little flavor from the sea with crab? While it takes a lot of ingredients to put these two together, the results are tasty cakes perfect for a warm summer evening. Crab meat can bring a lesson into sea life to your kitchen. Crabs are generally covered with a thick exoskeleton, and armed with a single pair of claws. They’re found all over the world in oceans, fresh water and on land. With about 850 different species, the crabs are found most frequently in tropical regions. Just like kids, crabs come in a variety of sizes. They can be as small as a few millimeters wide to having a leg span of 13 feet – that would be the Japanese spider crab, probably not the one you’re cooking today. We’re using a recipe from Oprah.com today. It will serve four and although the recipe called for frozen corn, let’s buy it fresh from the local farmers’ market to get that summery flavor. In a bowl, combine crab, onion, garlic, corn, bell pepper and celery. In another bowl, mix mayonnaise, dry mustard, cumin, coriander, salt, pepper, egg and 1/4 cup saltine crumbs. Add to crab mixture and stir just until combined. Form 8 patties; chill. In a large sauté pan, heat 1 tablespoon olive oil and 1 tablespoon butter over medium-high flame. Coat each patty with remaining crumbs and cook until golden brown on each side, about 3 minutes per side. Add more butter and olive oil as needed. In a pan over low heat, toast cumin seeds until golden and fragrant. Remove from heat. Cool and grind in a spice grinder, in a mortar, or under a heavy pan on counter. In a medium bowl, combine all ingredients. 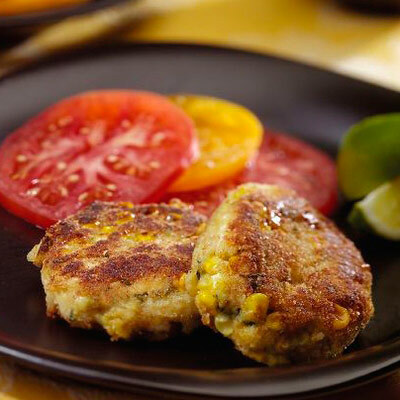 Serve crab cakes immediately with sauce. it had been very worthwhile you just read. I would like to quotation your post inside my weblog. It could? And you also et a forex account about Facebook? we would LOVE that – welcome to quote us anytime!